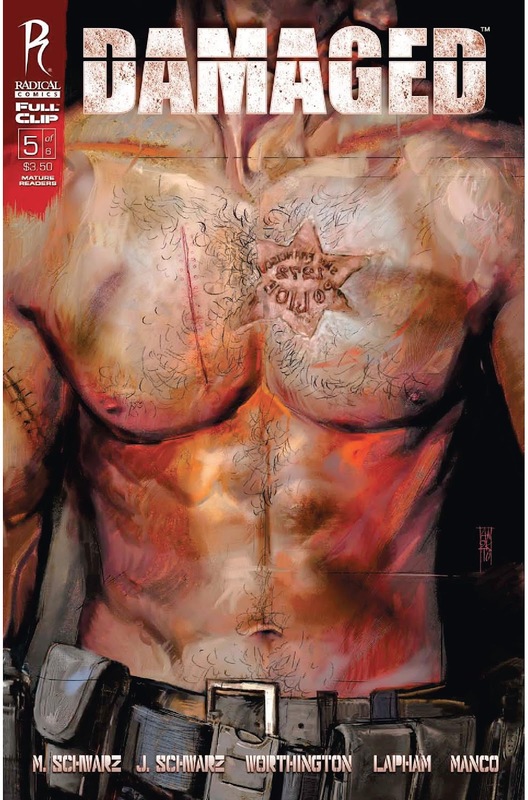 The Fellowship was fortunate enough to obtain a copy of DAMAGED #5 from Radical Publishing. The book is created by Michael Schwarz and John Schwarz and executive produced by Sam Worthington. David Lapham writes the story with art by Leonardo Manco. Just to catch up, Frank Lincoln is the head of a special police task force that is close to retirement. He has his hands full with training his replacement, deal with the police and political corruption, and face Henry, his former-cop-turned-vigilante brother who has returned to San Francisco after the death of a Russian mob boss. Meanwhile, Henry has taken on a protégé named Isaac Lordsman, who was a police officer sent to prison for refusing to help while a known gangster died in a car fire. Issue #5 finds Frank retired and trying to find his brother. Henry realizes that his new pupil is starting to lose control and does something that will bring the entire San Francisco police force after them. I am a little late getting into the book, but have truly enjoyed this mini-series. I cannot wait until issue #6 to see how this all ends! There is a “classic” PUNISHER vibe here and a well-crafted crime drama. The art is beautiful, almost cinematic. I can definitely see this as a blockbuster movie. That may indeed be the case since actor Sam Worthington (AVATAR, CLASH OF THE TITANS remake) is executive producing the comic. DAMAGED #5 is out in stores now.